Map of Laurence Harbor CDP in Middlesex County. Inset: Location of Middlesex County in New Jersey. Laurence Harbor is an unincorporated community and census-designated place (CDP) located on the Raritan Bay within Old Bridge Township, in Middlesex County, New Jersey, United States. As of the 2010 United States Census, the CDP's population was 6,536. According to the United States Census Bureau, the CDP had a total area of 2.953 square miles (7.648 km2), including 2.897 square miles (7.503 km2) of land and 0.056 square miles (0.145 km2) of water (1.90%). The CDP is located off Exit 120 of the Garden State Parkway. The main routes are Laurence Parkway and Route 35. The railroad, which no longer has a station in Laurence Harbor (It had a Morgan station during most of the 1st half of the 20th century, located right across Cheesequake Creek from Laurence Harbor), divides the community into eastern and western sections, the former being locally referred to as 'The Front'. Cliffwood Beach also borders Laurence Harbor when traveling south. The shore looks directly upon Staten Island's southern shore; the Verrazzano-Narrows Bridge, Lower Manhattan (including the Empire State Building, on a clear night) and Brooklyn can also be seen. Morgan is named after the 1703 family that had 645 acres (2.61 km2) here and were cousins of the infamous pirate captain Henry Morgan. Morgan is located one mile to the northwest, across the Cheesequake Creek and the Morgan Bridge on New Jersey Route 35. The Morgan Draw carries the North Jersey Coast Line. 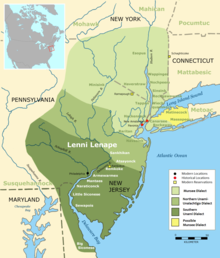 The lands known today as Laurence Harbor were part of the southernmost region inhabited by the Lenni Lenape tribe (also known as the Delaware) in the 17th century. In 1664, they became part of greater East Jersey, and in 1684 became part of a South Amboy, which was much larger than it is today. In 1869, Madison Township split off from South Amboy; it was renamed Old Bridge Township in 1975. European settlement of the area was linked to commerce passing through the Amboys along the Raritan River. From a military perspective, the area was useful for its high bayside cliffs, which allowed strategic observation of ships traveling between New York Harbor and the Atlantic Ocean. Laurence Harbor is named after land developer Laurence Lamb, who bought property in (what was then known as) Madison Township at the turn of the 20th century and subdivided it into bungalow-sized lots. Lamb established a 400-acre (1.6 km2) shorefront golf and country club on the site. Among those who frequented Mr. Lamb's establishment were Clark Gable, Guy Lombardo, the Prince of Wales and the Vanderbilts, who came to party and eat chingarora oysters, for which Raritan Bay was then famous. In 1928, the golf club was sold to developers for the above-mentioned construction of bungalows. A boardwalk, complete with a dance hall, casino, band shell, concession stands and a merry-go-round that played only one song, Let's Remember Pearl Harbor, provided entertainment, hot dogs and ice cream during the 1940s. For those traveling south from North Jersey or New York, it was the first stretch of Jersey Shore beachfront before reaching Keansburg or Asbury Park. According to a local historian who grew up in Old Bridge Township, the area was also used during Prohibition by rum runners who would lower their cargo of bootleg liquor overboard into the bay to be hauled ashore by local fishermen. The Ochwald Brickworks, a brickyard, operated in the area where the Bridgepointe townhouses now stand. The brick plant began operation in the early 1900s and continued to the early 1960s. Its 60 workers produced more than 84,000 bricks per day. Nothing remains of the plant as all was demolished for residential dwellings. As of the 2010 United States Census, there were 6,536 people, 2,536 households, and 1,767.592 families residing in the CDP. The population density was 2,256.2 per square mile (871.1/km2). There were 2,650 housing units at an average density of 914.8 per square mile (353.2/km2). The racial makeup of the CDP was 80.17% (5,240) White, 5.94% (388) Black or African American, 0.26% (17) Native American, 8.12% (531) Asian, 0.00% (0) Pacific Islander, 3.32% (217) from other races, and 2.19% (143) from two or more races. Hispanic or Latino of any race were 11.03% (721) of the population. There were 2,536 households out of which 28.4% had children under the age of 18 living with them, 51.6% were married couples living together, 11.7% had a female householder with no husband present, and 30.3% were non-families. 24.8% of all households were made up of individuals, and 5.5% had someone living alone who was 65 years of age or older. The average household size was 2.57 and the average family size was 3.09. In the CDP, the population was spread out with 20.5% under the age of 18, 8.0% from 18 to 24, 30.8% from 25 to 44, 31.2% from 45 to 64, and 9.5% who were 65 years of age or older. The median age was 39.1 years. For every 100 females there were 101.4 males. For every 100 females ages 18 and older there were 99.8 males. As of the 2000 United States Census there were 6,227 people, 2,286 households, and 1,634 families residing in the CDP. The population density was 852.6/km2 (2,210.3/mi2). There were 2,362 housing units at an average density of 323.4/km2 (838.4/mi2). The racial makeup of the CDP was 90.65% White, 3.57% African American, 0.22% Native American, 2.20% Asian, 0.05% Pacific Islander, 1.64% from other races, and 1.67% from two or more races. Hispanic or Latino of any race were 6.86% of the population. There were 2,286 households out of which 34.4% had children under the age of 18 living with them, 55.6% were married couples living together, 11.5% had a female householder with no husband present, and 28.5% were non-families. 22.7% of all households were made up of individuals and 4.9% had someone living alone who was 65 years of age or older. The average household size was 2.72 and the average family size was 3.25. In the CDP the population was spread out with 25.6% under the age of 18, 7.4% from 18 to 24, 34.9% from 25 to 44, 24.5% from 45 to 64, and 7.5% who were 65 years of age or older. The median age was 36 years. For every 100 females, there were 104.0 males. For every 100 females age 18 and over, there were 100.1 males. The median income for a household in the CDP was $57,997, and the median income for a family was $61,470. Males had a median income of $46,439 versus $30,918 for females. The per capita income for the CDP was $23,619. About 4.3% of families and 5.6% of the population were below the poverty line, including 7.2% of those under age 18 and 10.8% of those age 65 or over. As this area was considered a beach resort back in the 1920s to 1950s, some houses along the waterfront and off Route 35 are bungalow style. Many have been updated to year-round use and some lots have been combined to build much larger houses or additions. Built along the high waterfront cliffs, many of the houses have a waterfront view overlooking the Rartian Bay, Verrazzano-Narrows Bridge, Outerbridge Crossing and New York City (Lower Manhattan, Staten Island and Brooklyn) in the distance. The higher elevation protects most of the homes from flooding and provides the benefit of a shore view without flood insurance. Bridgepointe, an upscale condo/townhouse development, was completed in 2005 and is located off Matawan Road very close to the Garden State Parkway Exit 120. This development, along with Parkview at Madison Apartment complex, also nearby, serves the needs of many commuters who make the daily work trek to New York and North Jersey. A large cleared area of land located behind Bridgepointe and Parkview at Madison was slated for a high end hotel, convention center, business complex, a New Jersey Transit train station and housing. Construction never began; however, the plans still remain on hold and are occasionally brought up within the township. Laurence Harbor is home to Old Bridge Waterfront Park, which consists of a new boardwalk (the old boardwalk was destroyed in the 1940–1950s) that was completed in 2002. The beachfront was redone through a joint venture by Old Bridge Township, New Jersey and Middlesex County Parks Department. It extends approximately one mile from the Old Bridge Police substation south, to the Aberdeen Township neighborhood of Cliffwood Beach, and runs parallel with New Jersey Route 35. This area is very popular for fishing as three jetties extend into Raritan Bay and are in excellent condition, also recently redone in the past ten years[when?]. The park's boardwalk is also popular for jogging and dog walking. At the northern parking lot of the park, there is bay beach swimming access along with a bathroom and showers. On October 29, 2012, Hurricane Sandy slammed into Southern New Jersey. Its resulting storm surge, estimated to be in excess of 15–20 feet above sea level, destroyed portions of the Old Bridge Waterfront Park. Following Sandy improvements to the boardwalk jetty and parks were performed in 2014 when the resources became available. There are now new parks and a new boardwalk and jetty railing, and improved erosion protection along the bay's edge. Laurence Harbor is surrounded by diverse wetlands and bay front. The shallow bay front provides habitat for migratory birds to stop and feed. Except for a few cold winter months, great egrets can be seen frequently in the area. In late September and October before freezing temperatures, the egrets can be found in large numbers. Large Atlantic horseshoe crabs can be seen in the hundreds spawning along the shoreline in April. During fall and early spring, sea gulls can be seen foraging for food by picking mussels and clams out of the bay, flying up, and dropping them on the local jetties to break them open and feed. A diverse range of fish frequent and spawn in the local waters. Striped bass feed along the coastline in the early spring when the water temperature reaches approximately 45 degrees, begin to leave when the water gets warm enough for the bluefish, and return when the water cools in the fall. With birds at times following their feeding frenzies, bluefish feed heavily when they first arrive in spring. Various size bluefish remain in the water throughout the summer and into fall. Other fish that are known to be along the bay are black drum, fluke, winter flounder, eels, cow nose rays, skate, and weakfish. Along the boardwalk amongst the sand dunes, there are honeysuckle trees that blossom in the spring. There have been sightings of wildlife such as the common box turtle along the boardwalk. Pollution issues are being addressed on the southern half of the Old Bridge Waterfront Park. The main beach has been contaminated with toxic levels of lead. The Environmental Protection Agency has closed the beach to the public. There is information on the site at their web site under the National Priorities List for the Raritan Bay Slag Superfund Site. It is believed that slag from the National Lead factory in Sayreville was placed along the retaining wall in the 1960s and the 1970s to prevent erosion. Additionally, the same slag was used to build an entire jetty on the northern end of Morgan Bridge in Morgan. The slag comes in the form of about 20" diameter discs similar in shape to tire hubs and some are disc halves. The slag was a byproduct from the lead refining process that contains mostly steel with small percentages of lead and other heavy metals. The slag does not significantly affect the water quality due to dilution from ocean water that continuously comes in and out of the bay. Testing showed that the sand under the slag has lead particulates that have separated over time and there are traces of lead particulates in the sand below the tidal line. Once the slag is removed or contained the beach will be reopened. ^ U.S. Geological Survey Geographic Names Information System: Laurence Harbor Park Census Designated Place, Geographic Names Information System. Accessed November 28, 2012. ^ a b c d e f DP-1 - Profile of General Population and Housing Characteristics: 2010 Demographic Profile Data for Laurence Harbor CDP, New Jersey, United States Census Bureau. Accessed November 28, 2012. ^ New Jersey: 2010 - Population and Housing Unit Counts - 2010 Census of Population and Housing (CPH-2-32), United States Census Bureau, August 2012. Accessed November 28, 2012. ^ GCT-PH1 - Population, Housing Units, Area, and Density: 2010 - County -- County Subdivision and Place from the 2010 Census Summary File 1 for Middlesex County, New Jersey, United States Census Bureau. Accessed November 28, 2012. ^ a b Cheslow, Jerry. "LIVING IN/Laurence Harbor, N.J.; An Old Haunt Re-emerges on Raritan Bay", The New York Times, December 26, 2004. Accessed November 28, 2012. "A two-square-mile enclave in Old Bridge Township, Laurence Harbor comprises mainly compact two- and three-bedroom winterized bungalows built in the 20s and 30s on 25- or 50-by-100-foot lots, and is one of the most affordable neighborhoods in New Jersey's booming Middlesex County.... Laurence Harbor is named for Laurence Lamb, a turn-of-the-20th-century entrepreneur who established a 400-acre (1.6 km2) shorefront golf and country club on the site." ^ Snyder, John P. The Story of New Jersey's Civil Boundaries: 1606-1968, Bureau of Geology and Topography; Trenton, New Jersey; 1969. p. 170. Accessed November 28, 2012. ^ Staff. 1980 Census of Population: Number of Inhabitants United States Summary, p. 1-141. United States Census Bureau, June 1983. Accessed June 28, 2015. ^ a b c d e DP-1 - Profile of General Demographic Characteristics: 2000 from the Census 2000 Summary File 1 (SF 1) 100-Percent Data for Laurence Harbor CDP, New Jersey, United States Census Bureau. Accessed November 28, 2012. ^ a b Raritan Bay Slag, United States Environmental Protection Agency. Accessed November 28, 2012. ^ DiIonno, Mark. "Di Ionno: Ghosts of industrial past keep Laurence Harbor from its beach", The Star-Ledger, June 24, 2012. Accessed July 21, 2016. "The problem is lead-laden slag, which was taken from the old National Lead industrial site in Sayreville, where Dutch Boy paint was made, and used to anchor jetties and bolster the seawall in the area." This page was last edited on 10 December 2018, at 19:10 (UTC).